It’s the year 2019, and the Secretary General of the United Nations has announced the arrival of alien life. How do you react? The answer will largely depend on the science fiction films you’ve seen, some apocalyptic and others more benign. Since George Melies' Le Voyage Dans La Lune, the cinema has inadvertently prepared mankind for the arrival of the unknown. Some films have instructed us to hide, some to fight back and some, on rare occasions, to befriend the extra-terrestrial guests. For practical purposes, however, we here at Screen Rant have taken it upon ourselves to prepare you for the worst. Should an alien invasion happen during our lifetime, you must know how to survive. Lesson Learned: Befriend Tom Cruise. Though modern audiences knew what they were watching, Steven Spielberg’s 2005 re-imagining of War of the Worlds still packed in a lot of scares. While diverging from Wells’ classic invasion story by having the tripods be previously planted beneath earth’s surface, Spielberg unflinchingly depicts the aliens' attempt at incinerating and harvesting mankind. These tripods are hunters and gatherers of the most devious kind, and unless your name is Tom Cruise or Dakota Fanning, they’ll have their way with you. How to survive? Get out of the streets, seek shelter and avoid shotgun-toting loonies like Harlan Ogilvy (Tim Robbins). Lesson Learned: Fly Air Force One. Roland Emmerich has made a lot of disaster epics, though none are as beloved as Independence Day. Replete with vintage Will Smith, crazy-good Randy Quaid, nerd-master Jeff Goldblum and Greek-orator Bill Pullman, ID:4 teaches us how to retaliate against an alien species bent on total annihilation. Thanks to Pullman's rousing speech, the movie also shows that a global invasion would quickly surrender mankind’s petty differences and demand intercontinental teamwork in the fight to survive. As with War of the Worlds, victory lies in disabling the alien’s force fields. While countless souls must perish to do so, simply hijack a downed alien aircraft and fly it into the mother ship. After watching Will Smith work his magic, you’ll know what to do from there. Hopefully, Independence Day: Resurgence will give us of more of the goods. Lesson Learned: Always carry a whiskey bottle. Thanks to its clever framing of the invasion genre, this Cloverfield interquel posits whether humans can be as ruthless as aliens during times of uncertainty. For Michelle (Mary Elizabeth Winstead) and Emmett (John Gallagher Jr.), there appear to be few differences between getting attacked by aliens and being held captive by the taciturn Howard (John Goodman). To the vigilant farmer’s credit, however, building an underground, air-locked bunker may be the best resistance to impending invasion. In director Dan Trachtenberg’s covertly-released but successful film, the aliens wage chemical warfare, crop-dusting the helpless populace with an airborne weapon of unknown origin. Using both her brain and brawn, Michelle investigates the aliens outside with a DIY-hazmat suit of her own. As she quickly discovers, it may have been best to stay underground. Lesson Learned: Run. Being pursued by an invisible creature is an almost spiritual dilemma. In John McTiernan’s 1987 classic, Predator, that terrifying conundrum is brought to life. After a restless squadron of commandos is sent on a rescue mission to a distant jungle, the team is steadily dismantled by a cloaked alien killer. As the death toll rises, Dutch (Arnold Schwarzenneger) is forced to meet the Predator on equal ground. Using H2O as a disabling agent for the alien’s invisibility, Dutch cakes himself in mud to further escape its infrared vision. When Dutch finally out-dukes the Predator, he realizes the alien is pre-programmed for self-destruction, rendering their entire cage match an utterly worthless affair. Fun fact: Shane Black, who has penned a sequel to the film that he also intends to direct, starred in the original film as the highly disposable Hawkins. Lesson Learned: Finish your beer. If the alien apocalypse comes upon us, nothing will be more important than our friends. Edgar Wright’s bookend to the Cornetto trilogy, The World’s End, imagines an alien invasion that replaces humans with androids. Lesson Learned: Some aliens like music. Steven Spielberg has built his career on curiosity. In his first extraterrestrial drama, Close Encounters of the Third Kind, he fashions a world of wonderment. While their force is magnetic and psychologically influential, the aliens in this 1977 adventure are more harmless than hell-bent. Based off the classifications of astronomer and ufologist, J. Allen Hynek, “close encounters” refers to the proximity of a human interaction with aliens. While many individuals may be able to claim a close encounter of the first kind (witnessing an unidentified flying object in the distance), close encounters of the third kind refer to the undeniable presence of an alien beings. 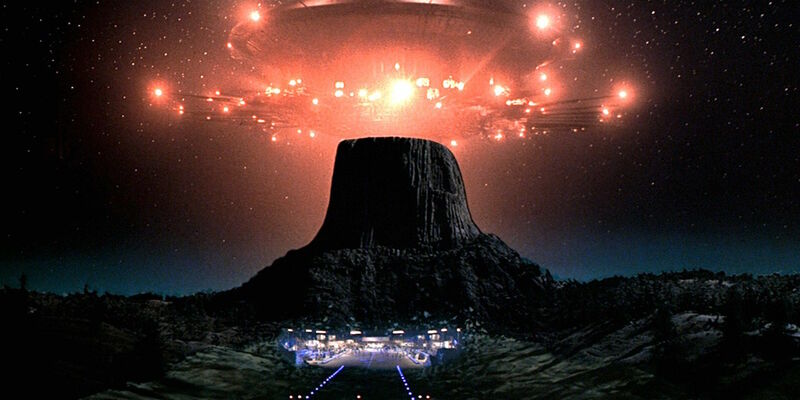 In Spielberg’s film, several individuals are drawn to Devil’s Tower anticipating an alien interaction, including Roy Neary (Richard Dreyfuss) and Barry Guiler (Cary Guffey). Their imagination and instincts take them to a place of discovery and awe. The one film featured here without an honest to goodness invasion, Contact sets up a universe where intergalactic relations could become possible. In Robert Zemeckis' daring film that unites the religious, the scientific and the political, we meet Eleanor Arroway (Jodie Foster), a woman who has dedicated her life to making contact with extraterrestrial life. Her drive to touch the unknown is fueled by the early death of both her parents. Rejected by Congressional funding and doubted by her colleagues, Eleanor spends years reaching out into the great beyond without any signals meeting her on the way. This, of course, changes in Zemeckis' story, as Eleanor makes contact with alien life and gets the opportunity to travel 25 light years away so she can meet them. Call it Close Encounters of the Fifth Kind. Lesson Learned: Some come in peace. In the midst of the Cold War, a large extraterrestrial spacecraft lands near the White House. Its presence throws the world for a whirl, and when Klaatu (Michael Rennie) exits his platinum ship, the civilians go mad. Tanks and military flank the flying saucer and one particularly jumpy soldier shoots the alien being as he approaches. Down for the count, Klaatu rises up and welcomes his massive bodyguard named Gort, a metallic android with incinerating heat-seeking vision. As he emerges from the ship and walks down its futuristic runway, the crowd gasps in horror. Despite all of this, the aliens in Robert Wise's film don't want to fight. On a mission of peace, Klaatu declares that an intergalactic tribunal has monitored earth's violent activity and demanded they call an end to their aggression. The Day the Earth Stood Still is more a cautionary tale than one of destruction. Perhaps this explains the lack of interest in the film's 2008 remake, which depicted the end of the world, rather than continuing the original movie's focus on preventing that scenario. Lesson Learned: Cornfields are creepy. Crop circles have bewildered mankind for years. How perfect, then, for M. Night Shyamalan to prey upon these insecurities and build an alien adventure around them. In Signs, his pseudo-religious and extraterrestrial sci-fi film, Shyamalan localizes the fear of invasion to a small-town, Catholic family led by Father Graham Hess (Mel Gibson). Since the death of his wife and the growing "signs" of supernatural disturbances around his house, Hess has distanced himself from his priestly duties. Hearing of global "light" sightings, Graham and his family barricade themselves from the threat. Unfortunately, their house has already been targeted. Along with its thrills, the movie's underrated sense of humor is greatly welcome amid the creepy cornfield. When Graham and Merrill dart out of the house to pursue the encroaching alien, Graham shouts, "Ah! I'm insane with anger!" Running around the house, he follows up that gem with, "I'm losing my mind!" Few actors could pull this off with confidence equal to Mel Gibson. Lesson Learned: Judge not, lest ye be judged. Neill Blomkamp's 2009 sci-fi film solidified the director as a big-budget storyteller with indie-film sentiments. District 9 depicts an alternate universe where South Africa has been visited by a massive alien mothership that hovers over the country and infests its population with malnourished creatures called Prawns. This is a different sort of invasion than we're used to seeing, however. More of a political and social culture clash than all-out war, District 9 creates an immigration morality play, asking how we might coexist with an alien species. Drawing on timeless international themes of migration and the long history of internment, Blomkamp sympathizes with the Prawns' plight by having his leading man, Wikus van de Merwe (Sharlto Copley), become the very thing he was hired to fight against. Another cult classic in the making, Joe Cornish's Attack the Block turns south London gangbangers into the ultimate resistance against alien beasts. Starring John Boyega as the gang leader Moses, Attack the Block chooses unlikely heroes to defend their turf from gorilla-like extraterrestrials. Produced by Edgar Wright and Big Talk Pictures (home of Shaun of the Dead, Hot Fuzz, Scott Pilgrim vs. The World and more), the movie pulsates with energy and tension. While it may be low budget in comparison to other films in the genre, Attack the Block packs a punch every minute its on screen. Not without its own share of social commentary, Cornish's invasion epic briefly examines inner city violence. Amid the carnage and chaos, Moses posits that the government is to blame: "Government probably bred those things to kill black boys. First they sent in drugs, then they sent guns and now they're sending monsters in to kill us. They don't care, man. We ain't killing each other fast enough. So they decided to speed up the process." Lesson Learned: Live. Die. Do it better. Doug Liman's revitalizing sci-fi entry somehow found humor in the apocalypse. Through the eyes of combat newbie and PR officer Bill Cage (Tom Cruise), we are taken on an adventure against the invading alien race, the Mimics. Hyper fast, violent and seemingly omniscient, the Mimics have steadily beaten back mankind to its last stronghold in England. When Cage is forced to join a modern D-Day assault on France, he and his squadron are decimated within minutes of landing on the beach. After killing a massive Mimic, Cage dies covered in its blood and wakes up back at the base. Time has reversed, thanks to a bilious baptism that has given him the gift of Groundhog Day. Like in a video game with endless respawns, Cage steadily charts a course to victory through a series of violent trial and error. With the help of Rita Vrataski (played by a lean and mean Emily Blunt), Cage finds a way to use his newfound powers to end the invasion. Out of all the preeminent sci-fi sendup films, Tim Burton's Mars Attacks! reigns supreme. Beyond the top-shelf cast and the dual performances of the zany Jack Nicholson, Burton's ridiculous action-romp bends, breaks and borrows every cliche in the book. Lampooning the science fiction films of the '50s, Burton imbues Mars Attacks! with enough one-dimensional characters and bland alien villains to completely destroy the genre. Forgoing the vintage social commentary of films like The Day the Earth Stood Still, Burton gives his aliens ray guns that blow away all sense of subtlety. As Jack Nicholson's President Dale so diplomatically inquires, "Why can't we work out our differences? Why can't we work things out? Little people, why can't we all just get along?" Critics may have been split on the film, but loyal audiences have since turned Mars Attacks! into a cult classic. Lesson Learned: The (alien) revolution will not be televised. With a revolutionary approach to the sci-fi genre, director Barry Sonnenfeld's Men in Black created a world where aliens and humans live side by side. The goal, according to Jay (Will Smith) and Kay (Tommy Lee Jones), is to keep that dangerous truth a secret for as long as possible. While interviewing to become Kay's partner, Jay asserts that people can handle the reality that aliens are already present on earth. Kay shoots down his optimism, saying "People are dumb, panicky, dangerous animals and you know it." As a result, the MIB agency stands to protect people from what they can't comprehend while uprooting the truly dangerous aliens at large. This includes Edgar the Bug, played by Vincent D'Onofrio in a role that combines Jim Carrey's wild antics with the fierceness of Wilson Fisk. Hopefully, some of that old alien magic will be retained for the forthcoming Men in Black/21 Jump Street crossover movie. Lesson Learned: Never fall asleep. In one of the greatest allegories in science fiction, The Invasion of the Body Snatchers tells of an extraterrestrial coup that replaces emotional and sentient humans with blank copies of themselves. As Matthew Bennell (Donald Sutherland) discovers in Philip Kauffman's remake of the original 1956 film, these body-swaps happen while people sleep. When Bennell happens upon a mossy and glazed clone of himself growing in a garden, he bludgeons it to smithereens with a rusted shovel. Impostors be damned! There can only be one Donald Sutherland. Unfortunately, the Pod People, the alien beings perpetuating this mass replacement, know that Matthew and everyone else will eventually succumb to sleep. Showing indifference and a lack of emotion may help you blend in, but only for some time. The Invasion of the Body Snatchers is perhaps the most insidious alien attack in any film, leaving audiences with a truly devastating finale. What other movies prepared us for an alien invasion? Let us know in the comments below!